From left to right: Lesi Dang, Sebastian Klembt, Anna Minguzzi, Maxime Richard and Emilien Durupt. 4Laboratoire FOTON, CNRS and INSA-Rennes, Rennes, France. Exciton-polaritons are short-lived hybrid excitations that are obtained in solid-state (semiconductor) microcavities in the strong coupling regime. “Hybrid” stands here for the fact that polaritons have a mixed photonic and excitonic nature (excitons are hydrogenoid bound electron-hole pair excitations in semiconductors) . As a result, they behave like photons interacting with each other and with their environment, like for instance thermal lattice vibrations. From the thermodynamics point-of view, a typical gas of polaritons does not meet any criterion of thermodynamical equilibrium : as particles, their lifetime is too short to reach a proper equilibration with their solid-state thermostat (i.e. thermal lattice vibrations); as waves, they cannot be considered as a black-body radiation since at the wavelength they display (in the visible), the electromagnetic vacuum can be considered as T=0K black-body, meaning that the polariton number at equilibrium is zero. Figure: Principle of polaritonic cooling. The black curve is a typical lower polariton dispersion ω(k||). The red spot and arrows figure the optically pumped polaritons (of energy ħω0). Some of the pumped polaritons are scattered by thermal phonons (spring-like arrow) and thus pick up an average energy ħΩf(T) (i.e. the average thermal phonons energy) from the thermal phonons bath, and finally recombine by emitting photons in vacuum (yellow arrows). In a recent experiment, we have studied how polaritons, with this nonequilibrium character, could be used as a coolant fluid to pick up heat from the surrounding thermal lattice vibrations and release it into the electromagnetic vacuum . 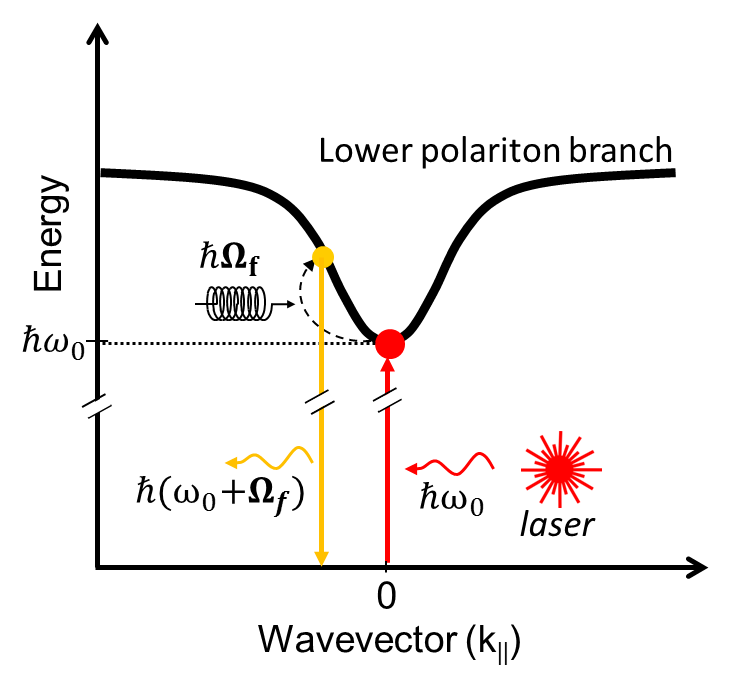 The principle of this mechanism is shown in Fig.1: polaritons are injected by resonant optical excitation in the lowest energy momentum state k||=0 (red arrows). This state is the “ground-state” of the polaritonic subsystem, in the sense that polaritons cannot have a lower total energy. It thus behaves as a “cold” fluid (an effective injected polariton temperature Tp=4K can be defined)  interacting with the much hotter gas (T= 20K to 150K) of thermal lattice vibrations (phonons). During its lifetime, a polariton can pick-up a thermal phonon’s energy by inelastic scattering, thus gaining in average an energy ħΩf(T) under the form of kinetic energy (yellow state in Fig.1), where ħΩf(T) is the average phonons energy. The most likely ensuing event is the annihilation of these excited polaritons into photons, which are emitted away from the microcavity. Thermodynamically, the net result is the transfer of local thermal vibrational energy into “escaping” electromagnetic energy. For bare photons (i.e. weakly “dressed” by the surrounding material), such an inelastic scattering with phonons is also used in the context of optical cooling [5,6] and known as anti-Stokes Raman scattering. In our experiment we have measured the thermal flux between the microcavity thermal phonons bath in a volume and the electromagnetic vacuum by counting the number and energy of the photons emitted within this mechanism. We found some other mechanisms competing with that described above like two-photon absorption and bare excitons anti-Stokes excitation. Taking them carefully into account, we measured a net maximum positive cooling power of Pcool= 80±16µW/cm3 for a cryostat temperature T=50K. This cooling power is still too weak to cause a sizeable temperature decrease in the present experiment which was not optimized for this purpose. However, in a better insulated environment, better optimized microcavity, and by removing every unwanted light absorbing layers (like the GaAs substrate in our case), it should be possible to increase this cooling power by orders of magnitude. This mechanism is an interesting alternative to more conventional optical cooling as for instance, it keeps on working in conditions where the latter usually turns off, like in for low temperatures. From a more fundamental point of view, this work shows that polaritons offer a unique playground to investigate the thermodynamics of nonequilibrium weakly interacting quantum fluids in contact with some environments at equilibrium (e.g. electromagnetic vacuum, phonons, and excitons). Iacopo Carusotto, Cristiano Ciuti, "Quantum fluids of light". Review of Modern Physics, 85, 299 (2013). Abstract. J. Kasprzak, D.D. Solnyshkov, R. André, Le Si Dang, G. Malpuech, "Formation of an Exciton Polariton Condensate: Thermodynamic versus Kinetic Regimes". Physical Review Letters, 101, 146404 (2008). Abstract. Sebastian Klembt, Emilien Durupt, Sanjoy Datta, Thorsten Klein, Augustin Baas, Yoan Léger, Carsten Kruse, Detlef Hommel, Anna Minguzzi, Maxime Richard, "Exciton-Polariton Gas as a Nonequilibrium Coolant". Physical Review Letters, 114, 186403 (2015). Abstract. For polaritons, the terms “hot” and “cold” are not refereeing to a proper equilibrium temperature, but rather, by analogy, to the polaritons steady-state energy distribution. Mansoor Sheik-Bahae, Richard I. Epstein, "Optical refrigeration". Nature Photonics, 1, 693 (2007). Abstract. Jun Zhang, Dehui Li, Renjie Chen, Qihua Xiong "Laser cooling of a semiconductor by 40 kelvin". Nature, 493, 504 (2013). Abstract.